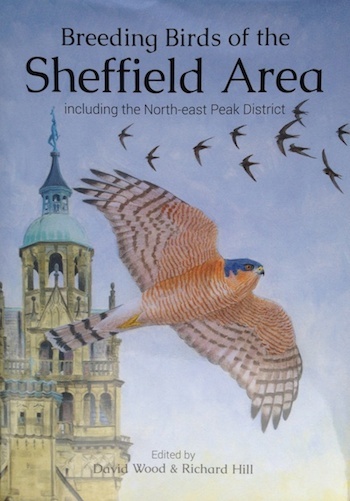 A couple of months after the last of the regular blog posts saw the young Peregrines safely fledged, it seems time to give a final update for the season. There will be a chance to hear about events of 2016 in a talk that I’ll be giving with Nicola Hemmings (who analysed the failed eggs this year and last) as part of the University’s ‘Festival of the Mind’. The talk, which is free, will take place on Monday 19th September at 8:00 pm in The Spiegeltent, Barker’s Pool, Central Sheffield. As in previous years, the juveniles remained around St George’s for several weeks after fledging, but unlike in previous years they have stayed through into the autumn. 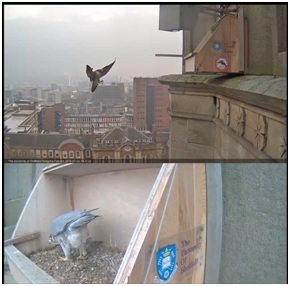 Anyone checking the webcam will have seen the adults and juveniles regularly using the perch and continuing to give great views. One fascinating snippet from analysis of the down taken when they were ringed: all three chicks that fledged this year were males, as was the egg that failed, and both chicks that fledged last year! The juveniles’ browner upperparts remain evident, as do the vertical streaks on the breast (as in the image above, with horizontal streaking on the adults, ). However, it appears that only two of the three juveniles are around, and have been for some time. What happened to the third is a mystery, but fingers crossed it is well and has made its way to a new territory: a young bird has been seen at Orgreave Lakes from time to time over the summer, so perhaps that’s our bird. That said, mortality rates for young Peregrines in their first year of life are high (over 50%), so it wouldn’t be unusual for it to have succumbed to disease or an accident as it tested its flight abilities. The adults are similarly visible, with one on the perch this evening. It’s definitely worth watching out for them, either via the webcam or ‘live’ if you’re in the area. For 2016, I’ll sign off with a screengrab from this morning as the sun rose to the E of Sheffield. Another striking image – one of many the birds have provided us with over recent months – and one that holds promise for the future. Thanks to everyone who’s supported the blog over the past months and hope to get the chance to chat with some of you in the Spiegeltent on Monday 19th.